Confession: Box brownies are where it’s at. Why mess with perfection? Especially when someone has already done all of the hard work FOR YOU? Brownies are finicky enough with their bake time, so I take the low road and rely on the old standby: the box brownie. If you wanted to know, this recipe is one that has worked for me (but I haven’t tried it in awhile). 1. Always use coffee instead of water. I love coffee, and you may not, but it gives a richer, more chocolatey flavor than straight up water. So go ahead, infuse your brownies with a stronger flavor! 2. Err on the side of under baking your brownies. Listen, we’ve all had brownies from both ends of the spectrum. From brown little bricks to “Wait, are you sure you baked these?” brownies are a TRIP in terms of bake time. Watch for the crackly top and DO NOT WAIT until your toothpick/fork/skewer comes out clean after you poke it into the brownies. It’ll be too late by then. You want some moist crumbs, and you want soft brownies, so don’t fall for that piece of advice. It works for cake; it doesn’t work for brownies. No one will mind if they’re a little on the gooey side as long as you have napkins. 4. Chill time doesn’t hurt. 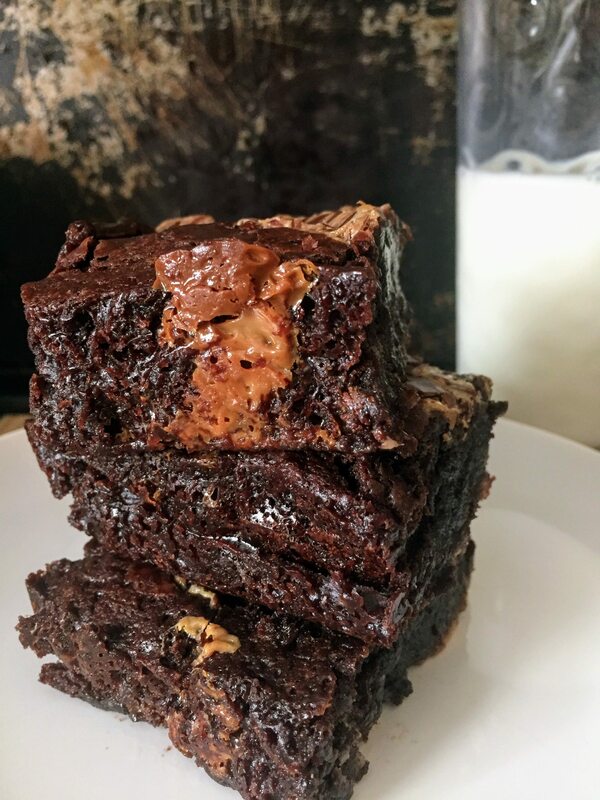 It’s painful to wait, but really, letting your brownies sit in the fridge overnight or even for a few hours will give the ingredients time to come together and enhance the flavor in a magical way. Brownies are like chocolate chip cookie dough here; let them sit for optimal taste. 5. Salt your brownies. I am biased because I love anything that’s sweet and salty, but really, you need SOMETHING to balance the overwhelming chocolate sweetness. Sprinkle some salt on top of your brownies before you bake them. Bonus points if it looks pretty and the flakes are large enough to notice. You won’t regret it, and your teeth will be happier. Mmk. 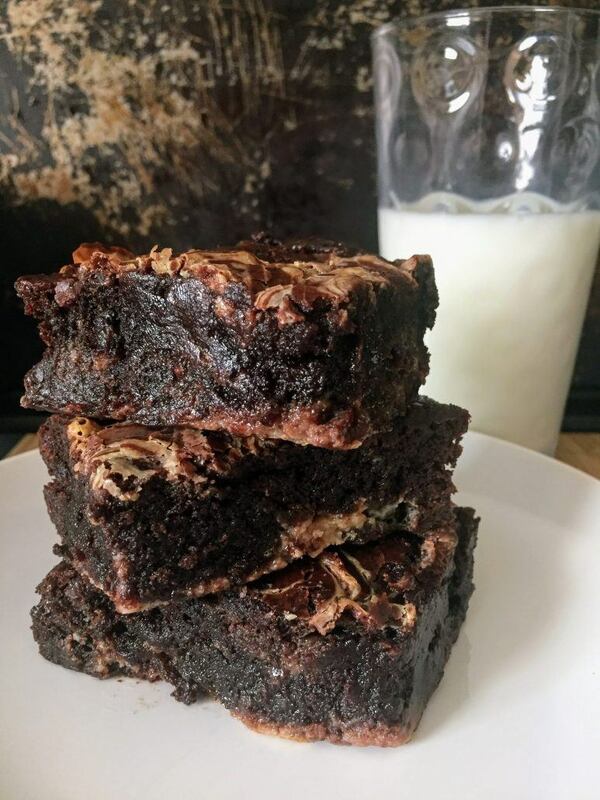 Now for the star of the show: box brownies kicked up a notch with a swirl of sweetened condensed milk. Get ready. You mix up your brownies, pour the batter into the pan, and swirl sweetened condensed milk into the batter with a knife. 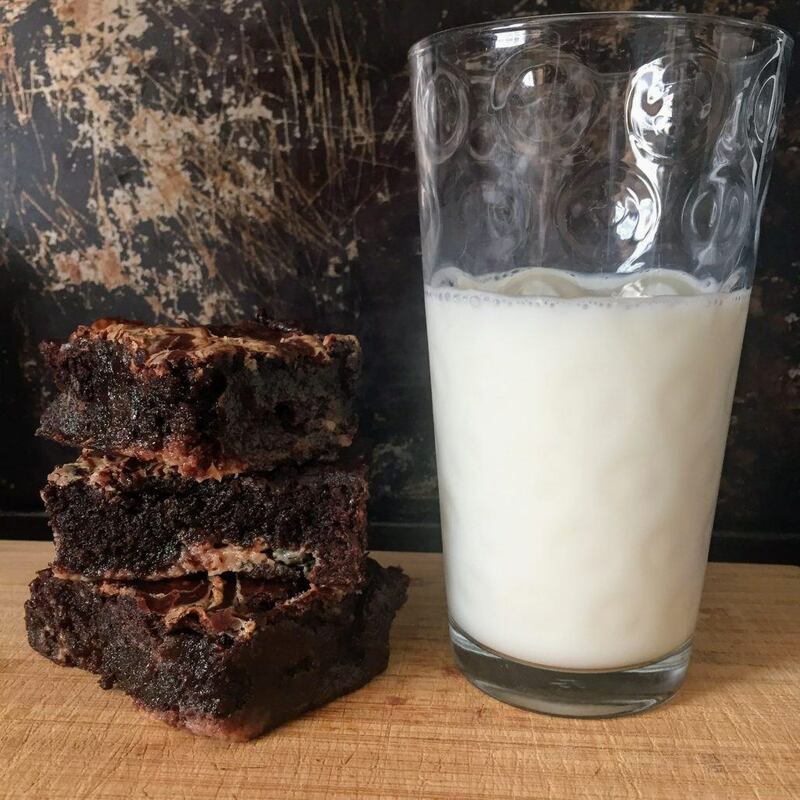 Take box brownies up a notch with the simple addition of sweetened condensed milk! Line an 8x8 metal baking pan with aluminum foil, and liberally spray the bottom and sides of pan with nonstick spray. In a large bowl, mix brownie mix, eggs, oil, vanilla, and coffee until batter is smooth and contains few to no lumps. Be sure to scrape the bottom of the bowl to incorporate all of the dry brownie mix. Pour the batter into prepared pan and, if desired, sprinkle with flaky sea salt. Measure out 1/2 cup of sweetened condensed milk, and pour oven the batter in a large, curved shape (like a 5 or W). Avoid pouring the milk too close to the edges of the pan. Then use a knife to swirl the milk into the batter. If desired, add more sweetened condensed milk and repeat the swirling process. For the richest brownies, cover and refrigerate the pan for at least 24 hours. I have kept brownie batter in the fridge for up to 36 hours before. This step IS optional, but it makes for a richer brownie. After the refrigeration period, preheat the oven to 325 degrees Fahrenheit. 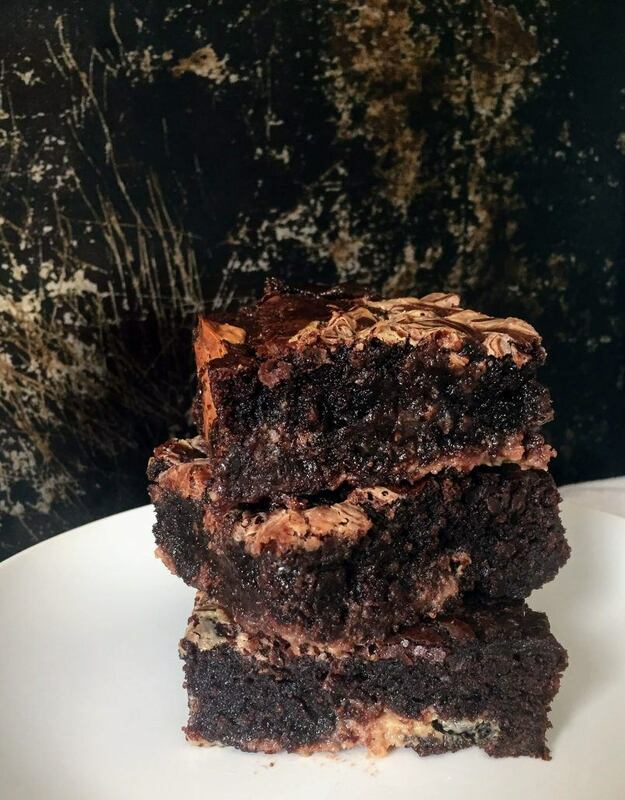 Bake brownies for 40-45 minutes or until a toothpick inserted comes out with some moist crumbs and the surface of the brownies begins to crack. Turn brownies at least once to ensure even baking. Allow to cool to room temperature before slicing. Then cut and enjoy! I’m Jenny, the heartbeat of jennythebaker.com. I’ve been baking since middle school when my Mom allowed me to assume the baking responsibilities for our family of seven. She watched me curdle cake fillings, bake flat, crunchy chocolate chip cookies, and forget critical ingredients; however, she somehow had a little faith in me. Who could have known that baking would become my lifelong hobby and destressor? Aaahhh , you’re killing me! Dec will try this twist. Can you imagine these brownies in a sundae? I’m dying thinking about how wonderful that would be!! Try them and let me know how they turn out :D! Sundaes always rule. Is it just me or is the ingredient list incorrect? It lists two boxes of brownie mix, two sweetened condensed milk amounts, etc., etc. Thanks for catching that, Mary! I just updated the post with the correct amounts. Is it two tablespoons of the freeze dried granular coffee, or just two tablespoons of black coffee that was perked? Brewed coffee is what the recipe is asking for, Diane. Hope they turn out well!